To coincide with National Astronomy Week (1-8 March), the University of Southampton is hosting a special free astronomical event for all the family. 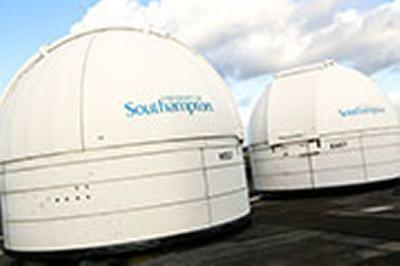 On Saturday 8 March from 5 to 9pm, members of the public are invited to see the stars and planets, in particular Jupiter which will be highly visible at this time, either from the comfort of the Soton Astrodome – the University’s inflatable mobile planetarium – or from the rooftop observatories. The Astrodome will be running planetarium shows during the evening and there will be a number of tours to view the stars and planets through the roof telescopes. There will also be two ‘Zooniverse’ workshops, led by Dr Jen Gupta, to show people how they can become a ‘citizen scientist’ and contribute to real astrophysics research. As the event also takes place on International Women’s Day, there will be three talks on astronomy research by Dr Caitriona Jackman, Dr Sadie Jones and Professor Malcolm Coe with theme of celebrating ‘Women in Astronomy’. There are lots of other free activities throughout the evening that do not require tickets. These include ‘World Wide Telescope’ tutorials and astrophotography workshops and the inflatable planets and play-doh solar system activities for young children, plus the Southampton Astronomical Society (SAS) will also be in the foyer with their telescopes.